The Teach North Korean Refugees Project will be holding a special session matching North Korean refugees with speech and writing coaches. If this project is successful, then we should have several North Korean refugees prepared to give speeches in English around the world. We will post application details within a few days, but to express your interest, send an email with your resume/bio and any details we should know about your writing or public speaking experience to TNKR.Secretary@gmail.com, but be sure to apply online here. Initially, it will be based on our wildly popular English Matching program in which refugees chose teachers, and they then study together. We will work together in developing a timeline for each refugee speaker in the project. If you have writing, public speaking, or other experience that you believe is relevant to this kind of project, then please contact us. This is open to people from around the world, but for the 12/20 session, it will be focused on those who can come to Seoul at least twice a month. Lee Eunkoo, co-director of TNKR, visited another tutoring session. – This class had two students, so they explained to each other, in English, about the things they were learning, for further reinforcement. Joo Yang and Yeonmi Park will both be speakers at the Students for Liberty International Summit, according to a Website BeforeItsNews.com and United Liberty. Yeah, well, before they were sought-after speakers, they were both students in the Teach North Korean Refugees Project. Joo Yang (then known as Chanyang Ju) was matched with tutors from mid 2013 until early 2014. Here’s an article I wrote for the Korea Times about the three months she studied intensively to prepared to deliver her first major speech in English, at the Asia Liberty Forum in New Delhi, India. In addition, I also heard that she was speaking at Columbia University a few days ago, but I didn’t hear about it until a few days later. And of course, I am so delighted that she recorded this broadcast about me, to be sent into North Korea. Yeonmi Park was in the project in mid 2013 for a short time, then returned with a vengeance from January-October of 2014, studying with 18 tutors during that time. I recently wrote about working together with Yeonmi, here are our most recent podcasts. She is now wrapping up her speaking tour that began in Europe and is ending in the USA. Joo Yang at the October 2013 matching session. with Chanyang Ju (Joo Yang) for her talk in India last January. Chanyang speaking in India at the Asia Liberty Forum, January 2014. Yeonmi returns to the Matching program in January 2014. She studied with 18 tutors during January-October 2014..
12월 영어매칭모임이 12월6일(토요일) 2시에 있습니다. TNKR 매칭 참여원하시는분들은 언제든지 신청서 작성해주세요! 영어매칭 자리 있는대로 연락드리겠습니다.!! 12월 스페인어 라틴어매칭모임이 12월6일(토요일) 12시에 있습니다. (강의안내) 12월 7일(일요일) 김정은시대를 경험한 북한생활 이란 주제로 강의가 있습니다. (자원봉사자 모집안내) 12월 21일(일요일) 물망초학교(경기도 여주)에서 크리스마스 파티가 있습니다. She sent the following, presented here with permission and as translated by Lee Eunkoo, co-director of TNKR. Hello! I am Angella. I have lived in South Korea for 7 years! As I am dealing with both studying in the university and working, I already recognized how much English is important in South Korean society. My starting point of studying English was basic level, however, fortunately I got opportunity to go the USA. Even if I had experiences to stay in the USA, still my English level was not enough. So, while I was trying to find English programmes, I heard about TNKR programme from my friend. In TNKR I could learn English what I want and study with the teachers who I want. I met two teachers, One is Helena who taught me mainly writing, another is Chole who focused on my reading skill. Two teachers came to Dongguk University where I am studying now. While I was studying with those teachers from TNKR I knew about English Contest for North Korean students held by Wooyang foundation and decided to test my English level by myself in the contest. My teachers in TNKR supported me at the best during preparing for the contest. Then I went through the first stage only for 10 candidates and today I heard I passed successfully the final stage for only 5 candidates. My final result will be announced soon, however regardless which prize I receive, I would like to say “Thank you so much my Teachers” especially the teaching classes about writing and reading skill and grammar are so much helpful for improving my English. Also I really appreciate “TNKR Team ” as well so much. I would like to share with TNKR my joy and delight. Thank you again! I will do my best more studying English! 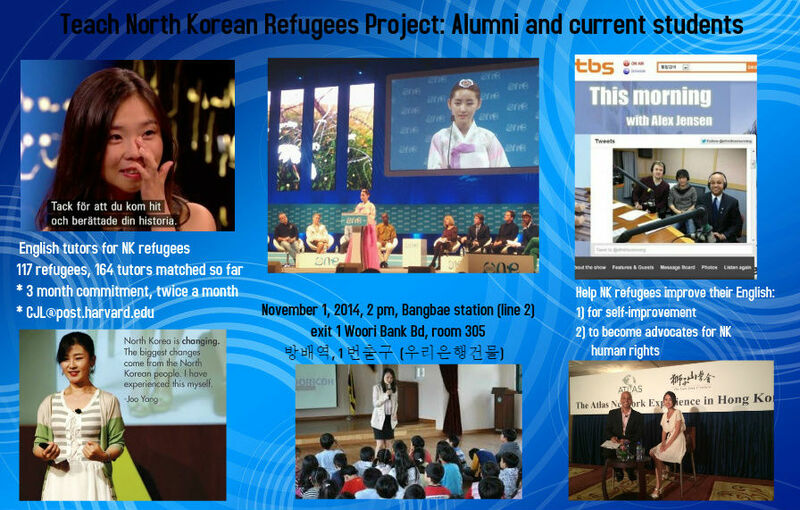 The Teach North Korean Refugees Project will be holding its 21st English Matching session on December 6, 2014, at Bangbae Station. We have so far directly matched 124 North Korean refugees and 9 South Koreans helping NK refugees with 174 volunteers. 1) Read the FAQs at: http://teachnorthkoreanrefugees.org/faq/ to make sure you understand what is expected. 3) We can only take so many volunteers per matching session so look for a confirmation email from TNKR.Secretary@gmail.com, if you are confirmed you will be asked to reply with a resume. 6) I recommend friending me while you go through the process. It will be required if you join TNKR. Once you leave TNKR, feel free to unfriend me. 7) The day before your session, look for and reply to a confirmation email from TNKR.Secretary@gmail.com, we just want to make sure you didn’t forget! After you have done those steps, you will receive an email from TNKR.Secretary@gmail.com confirming you for the event. * PLEASE NOTE: You are not confirmed for this event until you are confirmed directly by our Administrative Assistant (TNKR.Secretary@gmail.com) via email. Talking to me through Kakao, Facebook, at a coffee shop, mailing me a letter, yelling it to me as you pass by in a taxi don’t cut it. I’ve got an assistant now, she is the one who knows what’s really going on! WHAT TO EMAIL? You can send any extra materials you would like to use to present yourself to North Korean refugees joining. They will do the choosing, so make your case to them…. If you have never been to any of these sessions matching North Korean refugees with volunteers teaching them English, check out the FAQ with photos and a video. And as a final step, it helps when volunteers confirm their RSVPs the day before the session (we have had volunteers go through the process, then forget later). Please be aware this is not a socializing, friendship, research, dating, language exchange or hangout opportunity, for at least three months, we want the focus on teaching. To protect the reputation of the program, please conduct yourself as a professional at all times. If you would like to do a research project, documentary, or other special activity, just tell us and we can work with you on it. Feel free to forward to a friend who may be interested. If you would like to help, but are abroad or can’t for some other reason, you can also make a donation to the Teach North Korean Refugees project. * Bangbae station on line 2, exit 1. Walk to the top of the stairs. * Look to your left. There will be a Woori Bank teller machine. * Standing, looking directly at the teller machine, walk inside the building to the right of it. Walk up to the 3rd floor, room 305.